Indian River Habitat for Humanity is not only focused on building homes for families in need, but also building their future. 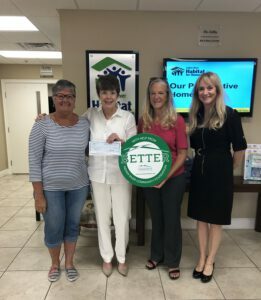 Indian River Community Foundation was honored to deliver a $20,000 check from an anonymous donor to help build Indian River Habitat for Humanity’s Scholarship Program. The scholarships are awarded to IRHH home owners and their families to continue their education, and to support participation in after-school and summer educational programs. To learn about all the great things happening at Indian River Habitat for Humanity, visit the “Nonprofit Search” tool.